REALLY GOOD IDEAS - 101 :frog-3: - This Forum is brought to you by The Mastiff Sweet Spot and Friends of the Forum. Any advice for red eyes and massive eye snot? Her eyes are not infected, we've been to the vet who said some mastiffs just have this problem. yes my puppy has this too her eyes are somewhat droopy and u can see red in the droopy area. Is that a fault? Regarding the red eyes, sometimes this is because the dog is actually not producing enough tears. I took one to A&M (the veterinary college) and they had some way of testing tear production! If that is the problem, the same drops that lubricate human eyes will work. Try SYSTANE. I do use those for her, but when she sees me getting that bottle out of her cupboard she gives me the death look. Thanks, that's good to know, I'll ask my vet if he can do that test. Cammie, try putting your dog on Vit C first. It cleared up a chronic eye problem in one of my boys, when nothing else did!! Vit C has cleared it up, she still has it a little but I think now it is more normal from having desert dust blown in. Her eyes aren't constantly producing eye boogers anymore... just now and again. Apparently vets on the whole do not test for tear production, my vet kinda looked at me funny when I asked, but then he already knows me for a hypochondriac! I have a regular grooming routine and putting something in the eyes is always part of it. Dust and dirt get caught in there in the lids and cause irritation. At first, they fight you...then it's almost like you can see them go ahhhhh. Feels good to them. 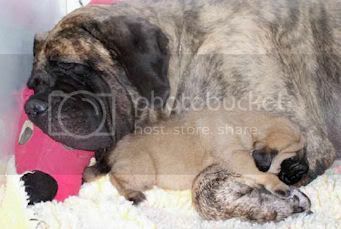 Mastiffs are prone to entropia (dont' know if thats spelled right) but sometimes its due to allergies. If you watch it, sometimes the eyelids swell and benadryl helps, and when they go back down it goes away. The vet actually had me convinced that tank had the entropia and suggested the surgery for 200 and said if not he would get cherry eye and have uclers, and it was just allergys. Just wanted to share this: I am a groomer, and most people spend way to much money at pet stores, when you can get stuff online for 1/6 the price. There are places like http://www.ryanspet.com and http://www.dresslersdog.com and many others where you can get everything for a fraction of the cost, and this is where the pet stores and the groomers buy the stuff, mark it up and sell it to you just to share. You can request a catalog. I can buy acollar5or example at a local store for 25.00 that I can buy online for 4.00 plus shipping. And they sell absolutley everything the stores do. For a healthy fun treat I freeze fruit. Pears, apples, whole and unpeeled. I have tried bananas but they get watery fast as they thaw. Large chunks of watermelon is good too. Jonah can spend about an hour playing and barking at a frozen pear....Great fun for them !! Regarding the Vit C for the eyes....how much? I was describing this to a friend and though I would put it up. The filter picks up all sorts of dander and dirt and dog hair - when I am vacuuming I just vacuume the filter clean - one filter will last at least a month. That's Boom-Boom cooling her belly in front of the fan - she is only 4.5 weeks along. Big litter coming. Linda - I love you more all the time!! My Lab sheds SO bad in spring and fall (I have no clue why fall...) I brush him (at least 3 brushes full) everyday and sweep the floors everyday and there is STILL lab hair. I vacuum twice a week and have to empty the canister 3-4 times to get the house done! StonyMastiff - where do you hang holiday decorations if the dogs chew up all the antlers? We use ours to hang stuff off - cheap hall tree - LOL! Regarding red goopy eyes, there is a wonderful drop. It's call MSM Water Drops. It used to be call MSM Eye Drops but the good ole FDA got after them claiming they couldn't call it Eye Drops. Anyway, I'm pretty sure there is a website to order this. It's called Rich's MSM Water Drops. Visine and all those types of products are quite drying to the membranes. I have used this when I had a severe infection from not changing my contacts often enough. My mastiff sheds a lot - my trainer recommend the Furminator - I bought it (about $50) at PetSmart and held onto that receipt - thinking if this thing doesn't work miracles - I'm getting my $50 bucks back. I have to say - it really works miracles!! Luka also LOVES to get brushed by it. It's best right after a bath, when they've just dried completely. But I use it in between to. You wouldn't believe the hair that thing gets out. Just thought I'd share. On the Blue Power Ear Wash Recipe, I found out by accident that there are 2 different types of Boric Acid powder, one used for pest, and one you get in the pharmacy. The pharmacy is where you want to get your boric acid from. I was really happy that I asked a pharmacist about this too. I forgot to add... this really works too. Our boy use to have BAD problems with his ears, but after using this 2 times... we have had no more problems. I was just helping Jamie build a whelping box for Tala and happened to remember that covering the inside of the box with contact paper will really help with clean-up and splinters are nothing to worry about. We used a beautiful granite look also quite handsome! For itchy scratchy skin, wash dog with a gentle tea tree oil shampoo, leaving on for about 2 minutes - rinse thoroughly, and follow with a puppy formula shampoo. The dog will smell wonderful. Hot spots respond well to straight tea tree oil (but it burns... so dab lightly with a cotton ball), let dry and reapply. It clears them up quickly (not more than 2x a day). For stinky feet, those cracked and sore paws - we first soak feet in warm water, wet a cotton ball with straight tea tree oil, blot onto wet feet, then dry completely. Helps disinfect the pads - can follow with bag balm if your pooch will let you put socks or sled shoes on to keep the pads from greasing your floors and rugs. Great for dogs like ours who love both the woods and the beach. If you get the cotton that hairdressers use when you get a perm and tear 5-6 inches feed it down into the ear and then saturate it you can then massage the blue ear wash down in there and the dog will shake it out and not so much mess and not too much going too far south!
" DAWN Power Dissolver. "..comes in a spray bottle, near the dish liquid! This is EXCELLENT for dissolving slobber! I just used it to clean my wooden feeding stand; which is coated with an epoxy type substance to make cleaning "easier" but is still a chore to scrub!! the slime coming right off; from when it had been solidified!! HIGH praise fro this product!! Magic erasers are a must have in our house, they will remove slinger marks off walls with out ruining the finish. they also remove hand grime from doorways and the fridge handle. Crayon marks too. Best thing we got has got to be the motion sensor dog water fountain. it hooks to your out door water spickit (sp. wrong) and it turns on when Beau wants a drink. this has been great for him, he always has fresh water and great for my laziness. I got it from petsmart and it was about $70.-- but well worth it. Plus the batteries have been going strong for 2 weeks now. i previously posted a tread about it and now i wanted to add it to this list. thankyou for putting this info. here! I have been searching for a way for my mother who has chronic lung problems to filter the air in her house. We were about ready to get the ionic breezes last year and decided not to because of reports that we read on problems that they could cause for people with asthma etc. I will be trying this natural solution. In my house and hers. For puppies or dogs that eat their poop try feeding them pineapple. It makes the poop smell really really bad and makes them not want to eat it. Just thought I'd add my 2 little cent worth. P.S. I have a Boxer/Mastiff and he loves Pineapple...ever since I started giving it to him he has not had poop breath. Use visine if you got soap in eyes after bath time (like dumby me did) Cleared up George's eye super fast. I bought Wilamina a full size air mattress at WallMart - $40. (The kind you blow up and take camping or keep for guests - battery operated inflator included) I cover it with a cheap mattress cover and sheets.. she loves it and spends most of her time on it. (I put it in front of the fireplace in the living room). She has been using the same mattress for about six months n ow. As I said before, I am a first time "puppy" mastiff owner. I have been reading through this thread and found a lot of helpful information. However, I still have some questions. We bathe Maggie in Pantene Shampoo to keep her soft and smelling great, but in reading through I noticed there seems to be alot more to grooming a mastiff than just bathing and nail clipping. Could someone lay it out for me, please? I looked in her ears and had the vet do the same. He said her ears are fine, but what exactly should I be looking for? I didn't see any hair to remove and no redness. Maggie is an inside dog for the most part. She goes outside to play with the children and when I am cleaning floors so she doesn't get that dirty. We bathe her about once a week, is this on target. 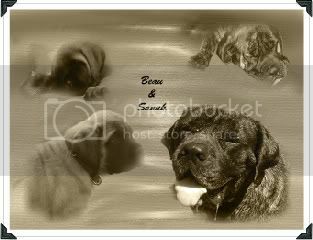 It would be great if there was a thread to lay out for new mastiff owners what should be done for their babies! I asked my vet a million and one questions but I'm afraid he (or anyone else in the area) isn't to familiar with the breed. I had rescues before in Mississippi, but we had a great vet there who took care of all grooming. Now that the responsibility is mine I'm kind of lost. Please help, I want Maggie to be healthy and happy and have a long, comfortable life. Hi I would suggest not bathing Maggie with Pantene. People shampoo is not that good for dogs. There are a lot of very good dog shampoos on the market . Pick one of them. If it helps I use Fresh and Clean by Lambert Kay . They do not burn the eyes if the shampoo should get in them. Hello, I am looking for a solution (preferably natural) to help my young dogs to shed their puppy coat, it seems to be taking a while despite brushing. I know more I bath them and brush right after , the more hair comes out and they do loose that puppy coat faster. I think bathing once a week is too often. From what I understand, mastiffs only technically only need baths a few times a year, otherwise you start stripping away the natural skin oils. Brushing daily/weekly is fine though. Also, Mary's suggestion about the shampoo is correct. There are many other better options meant for dog bathing than Pantene! We recently bought a great bed we found in a catalog. I use a four gallon bucket (you could use a five gallon bucket) -- I use the ones that the Nupro comes in - about four gallons - and fill it only 2/3 of the way up with water. I place a throw rug underneath it to catch any drips, but there are very few. The secret is to only fill the bucket 2/3 of the way full. I went to galvaized buckets ( the 1 and 2 gallon kind0 but I put the water buckets in cat litter pans to catch the drips. Regarding slowing down eating, I read somewhere that getting a large length of metal chain and putting it in the bowl so they have to pick the kibble out from inbetween the chain links works well. I have found that adding chopped vegetables like broccoli or green beans mixed in with the food works for my great dane - he doesn't like the veggies so he picks around them and it slows him way down. My mastiff loves the veggies though, so he gets them all when my dane is finished! they will make special order sizes for mastiffs. Interesting Product. We used the dish-washing liquid method too. It works well. Super blue ear wash is the most wonderful, however, on overly yeasty goopy owie ears use vodka instead of isopropyl alcohol...it doesn't burn. Vodka - what a super idea!! This is from my farrier who's blue healer got tangled with a skunk when they were at the hunting cabin with nothing but Odorban available to wash the dog. Mix 50/50 Odorban with water wash dog down let soak for five minutes. Rinse dog thoroughly with clean water. He swears by it. He even left the dog in the cabin the same night to sleepJ. Odorban is sold at Sam’s Club.